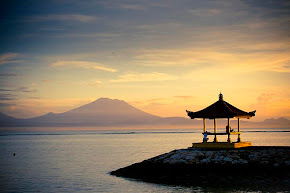 When you meet people in Bali, before greeting or saying good morning, good afternoon or good evening, remember to say this greeting first: Om Swastiastu. This is similar to saying Shalom, Salaam walaikum, Namaste, and so on. 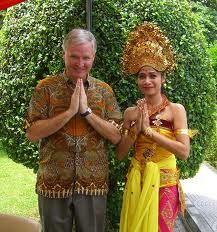 When you says Om Swastiastu, be sure incorporate both your hands in front of your chest (see picture). d. Excuse me! : Sugra nggih! f. How are you? : Punapi gatra? Or Kenken kabare?